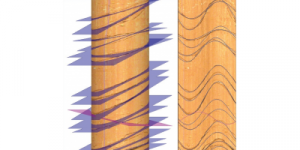 WellCAD is a Windows-based package for creating composite well logs. Prices for Single licenses including maintenance are listed below. For other license types, use the following multipliers: Network USB: 1.25x, Regional Floating: 1.5x, Global Floating: 2.0x. Annual Maintenance (18%) is optional for Single and Network USB licenses, and required for Regional and Global Floating licenses. 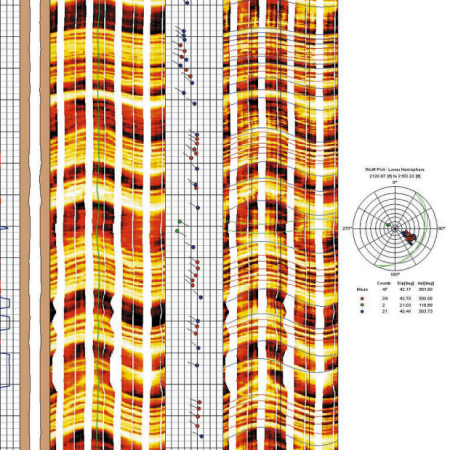 Combining technically excellent display, editing and analysis capabilities for well data, WellCAD has become the standard log composite software in the Mining, Oil / Gas and Geotechnical industries. Import ASCII, Excel, and LAS log data files. 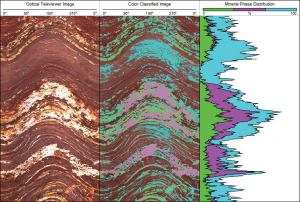 Import bitmap files (BMP, TIF, JPG, PNG) of cores cuttings and thin sections. 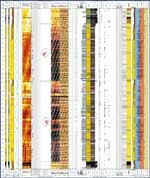 Display log curves based on measured depth, true vertical depth, elevation, or time. Use the advanced depth matching tool to align different types of data. Edit data with slice, shift, merge, resample, and filter tools and display with the original data. Use the formula parser to calculate new parameters based on multiple curves, e.g. lithology, oil and water saturation. Export document to BMP, EMF, PDF. Copy and paste to any Windows application. Output to any Windows printer. DIstribute graphic files with free WellCAD reader. Start with the WellCAD Basic / Reader / Crossplot module, and add more features as you need them. WellCAD is available with four different license types to suit your working needs. WellCAD 5.2 adds modules for processing nuclear magnetic resonance T2 data, a new Color Classification scheme for the Image & Structure Interpretation module, the new Casing Integrity module, and many new features to the Basic module. What are the system requirements for WellCAD? Microsoft Windows 10, 8, or 7, 32-bit and 64-bit. 220 MB of available hard-disk space for a full installation. 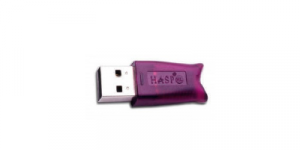 The WellCAD Basic / Reader / Crossplot module Single and Network licenses comes on a USB dongle and must be shipped. The additional modules and the Floating licenses can be delivered electronically. Shipping originates from the developer in Luxembourg. Please allow up to 3-5 business days for the order to be sent.